Composite Industrial Group, Inc. uses only the most efficient forms of blasting media including GMA PremiumBlast™ (Australian Garnet), Black Beauty® Abrasive (Coal Slag), and DuPont Starblast™ (Staurolite Sand). Other blasting media options are available upon request. 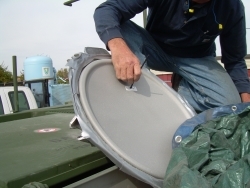 We can provide you with any level of surface preparation from a NACE No. 4/SSPC-SP7 Brush-Off Blast all the way up to a NACE No. 1/SSPC-SP5 White Metal Blast. We also offer SSPC-SP2 Hand Tool Cleaning and SSPC-SP3 Power Tool Cleaning for those less than critical applications. We have knowledgeable, experienced surface preparation specialists that know how to do the job right the first time. After the surface preparation is completed, we can apply a high performance coating system designed to handle your equipment’s working environment and extend the service life dramatically. We understand how critical downtime is and we make every effort to meet your deadline and provide you with a lasting solution. Typical blasting and coating applications can take as little as 1-2 days with most equipment being put back into service within a week. We can mobilize our equipment and be staged at your facility as early as tomorrow morning. 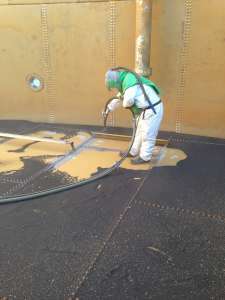 We are qualified and trained to work in confined spaces and can provide you with a full service resource for the surface preparation and coating systems required in these environments. Composite Industrial Group, Inc. also has the capability to handle smaller, more mobile projects at our blasting and coating facility in Cincinnati, Ohio.